Bike racing fans, can’t get enough of riding your bike and enjoy being amongst the spectacle, colour, and flair of one of Australia’s biggest sporting events join us for a Tour down Under Cycling Day Tour this January in Adelaide South Australia! Bike tours are certainly NOT all the same, there are those that do it as a ‘sidekick in life’ and then there are those that have been pedaling since they could walk…that is the Team @ Practice Bicycle Bike Tours, operating their ‘unique’ bike trips in only the very best locations to ‘practice bicycle’! You want to experience ‘great cycling’ what is great cycling you ask? Take a guided Cycling Day Tour whilst in Adelaide at the Tour down Under and feel the difference, experience what it’s like to ride with people who really ride bikes! With the perfect pace, no getting left behind, assistance with any problems, total confidence; you are certainly with the professionals with a very unique skill set, established over several decades of great cycling. A few hours with a Tour down Under Cycling Day Tour in the company of Practice Bicycle may not be enough to truly absorb the quality of this ride team, the knowledge of cycling, training & coaching, bike racing, it’s in their blood and ready to share with you. They are the locals, fabulous with people and what they do best is to ride with others to make you’re cycling memories. 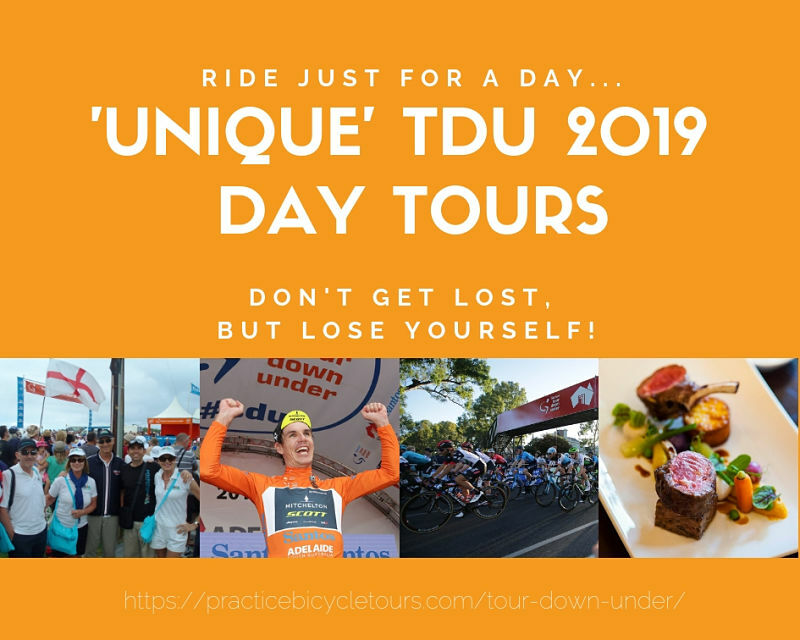 Experience for yourself a new level of cycling with a great day on the bike with a Tour down under Cycling Day Tour….you have to experience the perfect ride with Paul Hughes & Bridget Evans at Practice Bicycle Tours.